Microsoft will release the Windows 10 Fall Creators Update in September and the upcoming OS will include a new handwriting experience for people who use a pen with their PCs by introducing a new XAML-based handwriting panel that supports more gestures, easier editing, emoji, and more. Handwritten words converted to typed text. The handwriting panel instantly converts written words to typed text. When you fill the handwriting panel and lift your pen off the screen, the text shifts so that you can continue writing. 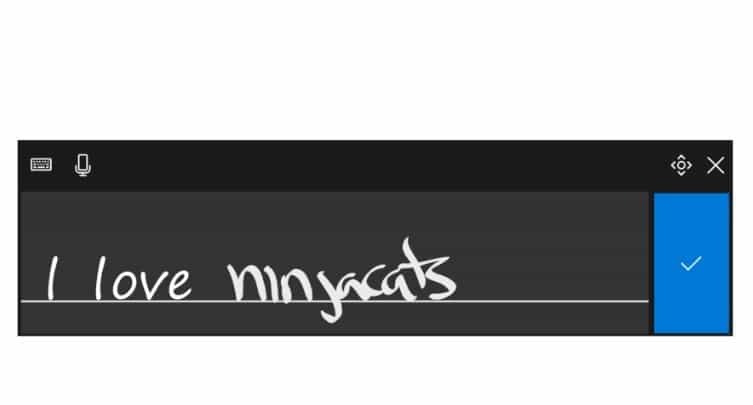 You can edit your text by selecting it while the handwriting panel is open. That text will appear within the panel so you can easily change it. If something was misrecognized, you can now ink the correct letters right on top of the converted text. Make corrections using ink gestures. You can easily edit converted text from within the handwriting panel using four new gestures: strikethrough, scratch, join, and split. The handwriting panel has two new buttons so you can easily add emoji or symbols without switching to the touch keyboard. Just tap the button, select your character, and that’s it. Pen & Windows Ink Settings now feature a new option to enable finger inking explicitly in order to avoid ink being drawn on the handwriting panel as you’re writing with your pen. Improved handwriting recognition for English (United States). Windows 10’s US English handwriting recognition engine is now more accurate. English mode for Simplified Chinese handwriting. When Chinese and English characters are inked together, the new English mode button will recognize the English words when handwriting in Simplified Chinese. Find My Pen: If you don’t know where you put your pen, you can at least see where you were when you last inked on your computer. Go to Settings > Update & Security > “Find My Device” and check out the new “Find My Pen” feature. Scrolling with the pen. You no longer need to use scrollbars or frequently switch between pen and touch when navigating. You can now scroll content with your pen as you would with your finger. Selection with the pen. Selection grippers are visible whenever text is selected via pen. You can also select text, objects, or ink faster by dragging the pen while the barrel button is pressed. It is worth mentioning that scrolling with the pen is currently supported only for UWP apps, but Win32 support is on the list.